What about this story drove you to write a book? Modern American ships don't just vanish. The story of El Faro seemed like a tale from another time, a 19th century shipwreck in the 21st century. How could this happen in 2015? From the moment I read about the disappearance of the ship, I was driven to unravel the mystery of the El Faro’s sinking. I wanted to understand how something so big, so technologically advanced—with GPS, radar, and satellite communications—could sail into a hurricane and slip out of our reach, off the radar, beyond the realm of any earthly technology. Why did El Faro sail straight into a Category 3 hurricane? Hurricane Joaquin was one of the first, but certainly not the last, superstorms fueled by the unnaturally hot waters of the Atlantic. Since the 1970s, the oceans have absorbed enough man- made energy to power every home in the world for the next 360 years. This is the heat that hurricanes thrive on. Because the Atlantic was superheated, Joaquin intensified into a major storm so quickly that the National Hurricane Center's forecasters had trouble keeping up with it. During the critical hours when the captain and crew were debating their route to Puerto Rico, forecasts were plagued with inconsistencies, inaccuracies, and uncertainty. If all hands were lost, how do we know what happened during the final hours aboard the ship before it sank? Nine months after the loss of El Faro, the ship’s black box was retrieved from 15,000 feet down on the ocean floor by an unmanned remote-controlled vehicle. This digital recorder contained 26 hours of conversation on the ship’s navigation bridge leading up to the accident. I used these conversations to create a gripping narrative of the events through the lost mariners’ own words. It is these conversations, which build in intensity, just like the hurricane itself, that make this story so haunting. Who was Captain Michael Davidson and why was he convinced that they would be fine? Much of this story is about the pressures put on America’s working people to risk their lives in the name of profit. Captain Davidson, 52, had high expectations for himself, as well as high expenses, including two daughters in college. He’d had a troubled employment history and needed this well-paying job, but had been recently passed over for a promotion. On the final voyage, it was clear that he was mad with worry about losing his prestigious position which made him desperate to prove that he was the kind of leader who could push his crew and ship through severe weather to deliver $25 million worth of goods on time to Puerto Rico. How did you research this story? I had many moving conversations with family members who lost their loved ones aboard the ship, as well as the El Faro's relief crew, esteemed members of the maritime community, and the coast guard's search and rescue team. I spent time with a 75-year-old retired shipbuilder who actually built the El Faro in the Philadelphia- based shipyard. To accurately recreate what happened during those twenty-six hours on El Faro’s bridge before the vessel was lost, I had to understand the mariner’s life firsthand. What was like to spend day after day on a working vessel at sea, beyond sight of land, among strangers? So I spent two weeks aboard a cargo ship crossing the Atlantic Ocean from Italy to Baltimore. I spent most of those long summer days sitting on a chair on the navigation bridge, the proverbial fly on the wall, watching the captain, mates, and helmsmen interact. I wrote many action-rich chapters on that bridge. I also piloted several deep draft vessels in and out of Jacksonville with the very same river pilot who took the El Faro out to sea for her final voyage. This was my first taste of the danger pilots subject themselves to every day. Why is shipping important to the American way of life? Few Americans spend much time thinking about the industry, but cheap global shipping is the backbone of 21st-century life—it’s how we get $300 Chinese-made laptops and $12 Indian-made cotton T-shirts. About 90 percent of worldwide trade travels by sea. Sift through stacks of H&M jeans or walk the shoe aisles at T.J. Maxx and inhale the shipping container’s stale perfume; that’s the scent of commerce. In other words, if the ships stopped coming, the American economy would collapse. What kind of people work on America's ships? Officers and engineers usually learn their trade at one of the country’s seven maritime academies (four in the Northeast); able seamen can ship out after high school. Most mariners plan on going to sea for a decade and then finding a job on land. It's not easy being on a ship for months at a time, away from friends and family, often without cell service or internet. The jobs are disappearing, too, as ships get bigger and the crews that run them get smaller. The mariners I met who have shipped since the 1970s talk about how the world has changed around them while they’ve stayed still. What was it like reading the 500-page transcript of the conversation on the El Faro's bridge leading up to the sinking? It was intensely emotional. Each officer and crewman on the bridge dealt with imminent disaster their own way and at every moment, I couldn't help but ask myself, what would I have done? It’s only natural to want to skip to the end of the transcript. But the true horror is in watching this disaster unfold over 26 hours and listening to how human beings just like you and me slowly confront a deadly situation they feel helpless to change. Are there any heroes in this tragic tale? Remarkably, yes. 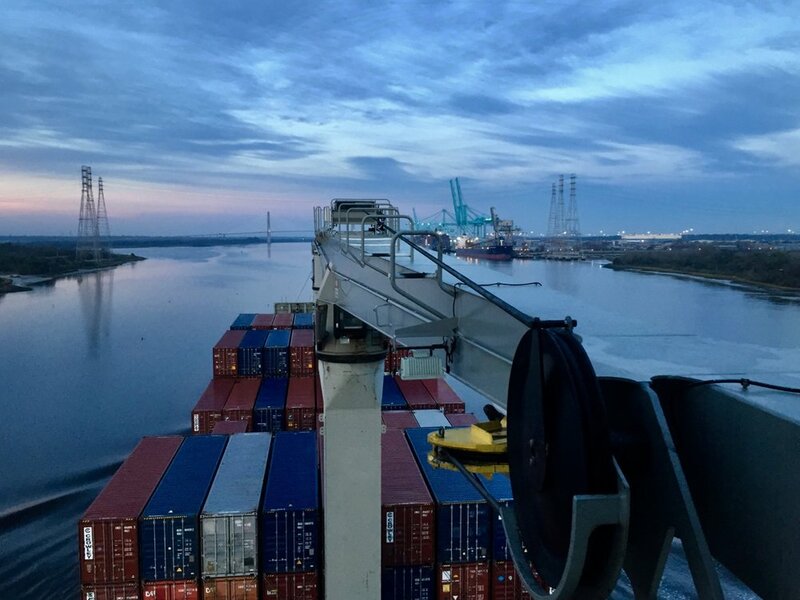 Even before El Faro left Jacksonville, off-duty Second Mate Charlie Baird texted Captain Davidson about the storm and gave him several route options to avoid the weather. The officers aboard El Faro, especially Second Mate Danielle Randolph and Third Mate Jeremie Riehm, tried repeatedly to convince the captain that they were heading for trouble. In the face of increasing danger, they were professional, respectful, and persistent. The coast guard’s search and rescue attempt when they lost communication with the ship during Hurricane Joaquin was one of the most heroic in its history. And after the ship was lost, the men and women of the NTSB and coast guard investigative teams worked for two years to uncover critical flaws in the system which they are using to advocate for stronger regulations over the shipping industry. Now more than ever, it's important to recognize that those employed by the federal government work for all of us. I witnessed firsthand how committed these individuals are to making our world a safer place. "A taut, chilling, and emotionally charged retelling of a doomed ship’s final days."